Hospitals and health systems are scrutinizing costs and being forced to make tough decisions affecting patients and their own financial status. Health technology acquisition, standardization, and utilization decisions are becoming ever more important as the costs associated with making wrong decisions continue to escalate. 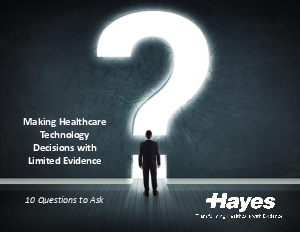 With the array of new technologies clamoring for attention, utilizing evidence is the foundation for meaningful decisions.